Write now, get a discount for one of nicest masseria in Puglia! Deluxe Private Villa, Guest House and Pool Set in its Own Olive Groves. Sleeps 10. Near Lovely Beaches. Searching for a luxury villa in Puglia to rent? Masseria La Rosa is a stone-built farmhouse in Salento, Puglia, set in its own private estate and bordered by ancient olive groves. Puglia is also affectionately known as “the heel of Italy’s boot”, and has a surprisingly international past, with Greek, Spanish and Norman influences. The villa comprises a main building and an annexe and is centred around two courtyards. The cloisters of the entrance courtyard feature imposing black glass and wrought iron lanterns. Inside, the open plan space comprises a well equipped kitchen, dining and living area and a fully-equipped utility room with washing machine and dishwasher. In the main house, there are three en-suite double bedrooms which do not interconnect, each with a door onto the courtyard. In the annexe, there are two twin rooms sharing a bathroom. This means the masseria can comfortably host up to ten people. The villa is provided with alarm system, free WI-FI and SKY TV. The masseria has courtyards, cloisters and arches which offer perfect cool spots for sunbathing and relaxing or dining “al fresco”. The back garden features a spacious pergola, a professionally-built stone pizza oven, a BBQ, an outdoor shower and a mosaic tiled infinity swimming pool to cool off when the summer sun is shining. Guests have access to the fully organic vegetable garden too. 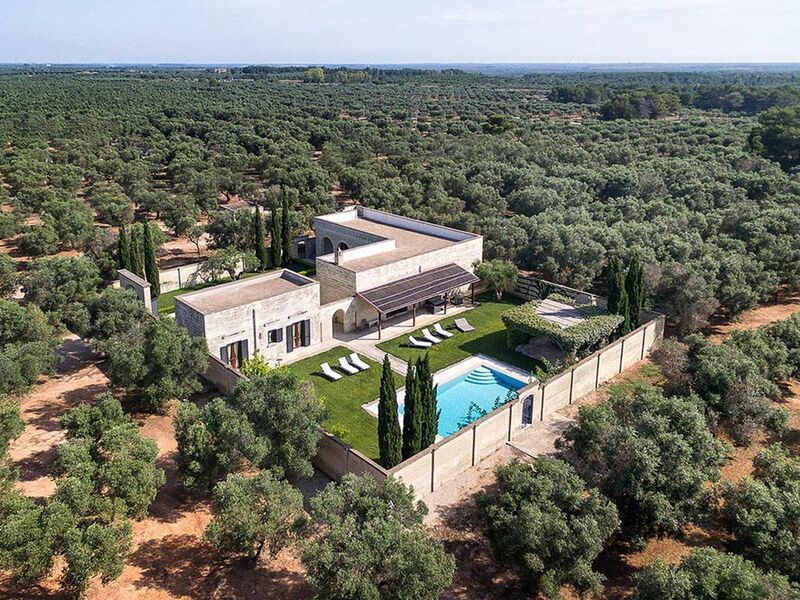 Masseria La Rosa is your perfect luxury villa in Puglia. It is ideal for a large family or a group of friends, with plenty of space and a tranquil setting yet close to the sea, shops and restaurants. The beach is a short 10km drive away. The beautiful city of Lecce, known as “the Florence of the South”, and the lively port of Otranto are both within very easy driving distance. Beautiful masseria, well-manicured property with lovely outdoor space! Excellent host management. Perfect for a family or group of couples - property offers a great balance of privacy and communal space. Very close proximity to Otranto beaches and local restaurants, but also very nice to stay at the villa. Irene was incredibly helpful and we could not have enjoyed our stay more! Would certainly stay again.